Colour Tinting and Uniformity Issues? There's been a lot of attention given to the new 27" screen from Dell ever since it was first leaked in October 2009. We didn't have much information at the time, only some leaked images but by January we had some specs and pricing as well which whetted the appetite of potential buyers even more. 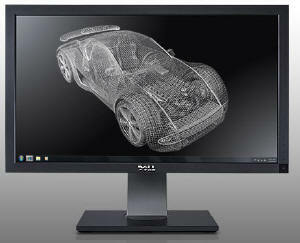 As if the release of a new Dell screen didn't attract enough interest as it was, Dell had upped the stakes with the new U2711 by introducing a super high 2560 x 1440 resolution and utilising an IPS panel which had made its way into their 24" range already, but not into their 27" models. The Dell U2410 had already proved extremely popular and now they were offering something equally interesting in the larger screen size. The U2711 is the same design at the smaller U2410 model. There is a fairly thin (25mm) black bezel around the panel, and a silver and black stand. The screen does feel a fair bit bigger horizontally than a 24" model so even those used to a 24" panel should feel a decent size upgrade there. The screen is a 16:9 format, so the vertical growth is not as noticeable. Overall the screen feels like an enlarged version of the U2410, which isn't a bad thing really. Materials were of good quality and the screen felt well built and pretty sturdy overall. The design of these new models feels a little 'blocky' in my opinion, with no real rounded edges. At this kind of size, its even more noticeable than the U2410, especially with the bigger stand footprint. The panel itself features a matte Anti Glare (AG) coating as opposed to any glossy solution. The panel actually sits a little bit back from the front of the bezel by about 5mm which is a little deeper than on most screens. The coating was very similar to that on the U2410 but I personally didn't find any problems with it being too grainy or anything and it was also very similar to the S-PVA based Dell 2405FPW. I know some users don't like the feel of the coating or prefer glossy solutions, so if you're worried try and see a U2410 or U2711 in practice. There is a decent range of ergonomic adjustments available from the new screen with a decent 100mm height adjustment, tilt and pivot available. 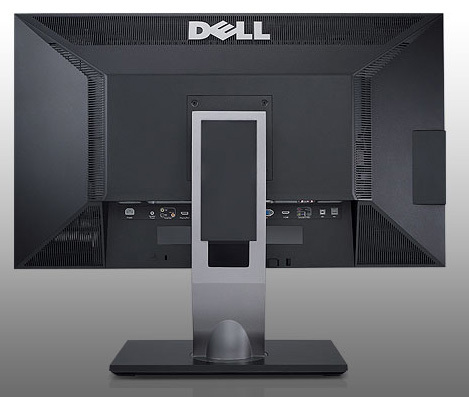 As with Dell's other screens, the monitor does offer a really good range of adjustments which are very useful for providing optimum positioning and user comfort. There is no rotate function from the U2711 which is due to the size of the screen, and not really missed in my opinion. The height adjustment is fairly smooth although can be a little stiff to move initially. The pivot was quite stiff too, and you have to hold the base in place really to manoeuvre the screen in this way. Tilt was far more easy to move and provided a good range for normal use. The panel did feel a little wobbly from side to side, probably due to the sheer size and centre of gravity, but this didn't prove any problem in normal use. If you shook it from side to side with your hands, you can wobble it, but I don't think you'd ever really do this would you?! The left hand side of the screen features a 2 port USB hub for easy access. 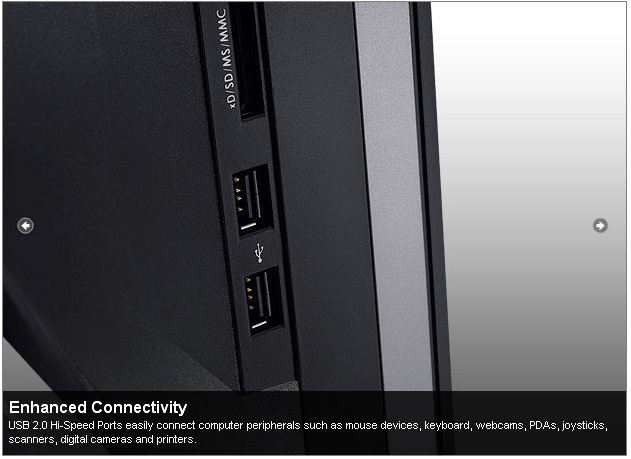 There are also 2 further ports next to the interface connections on the back underside of the screen (shown below). 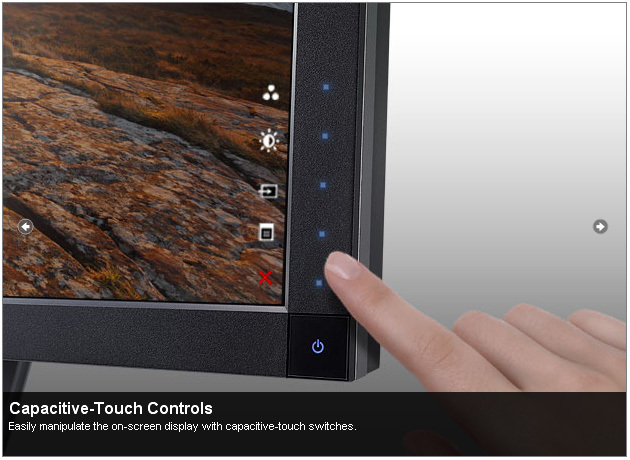 The 8-in-1 card reader is also featured on the side for easy access and is very handy for cameras and memory cards. The underside of the screen at the back features all the connections you might need. Nice to see 2x DVI here for connection of multiple PC's via a digital signal, both of which are HDCP certified. Also good to see HDMI and DisplayPort here as well for connection of external multimedia devices and to keep up with connection trends in the market. There's also component and composite for connecting some other devices, common in games consoles, DVD players and video cameras for instance. It seemed to take a fairly long time to switch to a digital input and power up initially when using DVI. This took about 5 second to do. Switching from DVI to VGA took about 2 seconds, but switching back took 5. This is related to the interface chip and I'm only mentioning it as I'm aware some people have talked about it across the web. 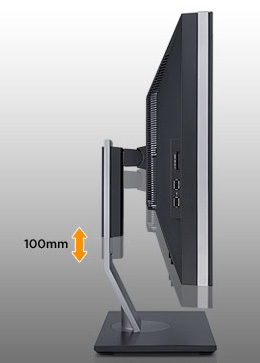 The screen comes packaged with a Dual link DVI, D-sub, HDMI and DisplayPort cable. The OSD operation buttons are very subtle and located on the bottom right hand edge of the screen. The power LED glows a blue colour when in operation and pulsates a subtle orange colour in standby. The other selection buttons are hidden until you hover your finger over the bottom button, at which point they all light up and pressing them gives access to the OSD menu. The OSD menu buttons are not labelled in any way. Instead, when the menu pops up, there are indicators on the screen itself telling you what each button does. I actually really liked this style of menu and it was easy to use and navigate, and very intuitive. By default the pressing of these buttons has an associated 'beep' sound which thankfully can be turned off in the menu as well as I find it quite loud and annoying. 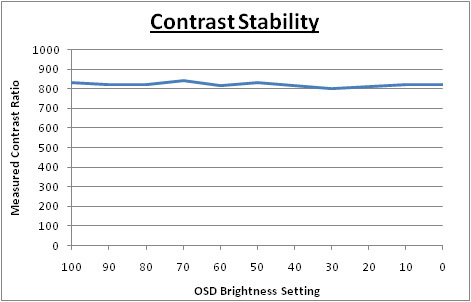 The OSD is shown above in the color settings menu. Here, you have access to all the preset modes as shown. You also have quick access to preset modes via the top operational button when you first pop up the menu on the screen. There is also quick access to brightness/contrast controls and input source. The OSD section for display settings is also shown, where you have access to the hardware aspect ratio controls (fill, aspect and 1:1) and access to the dynamic contrast ratio if you want to use it. 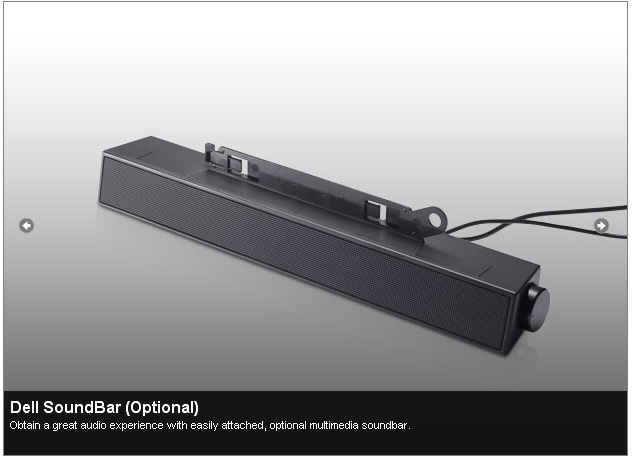 While there are no integrated speakers with the U2711 model, the screen is compatible with Dell's soundbar if you want, at an additional cost. In terms of power consumption the spec states typical usage of 113W (assuming no audio or USB connections) and less than 2W when in standby / sleep mode. The Dell U2711 utilises an H-IPS panel, capable on paper of producing 1.07 billion colours. The panel itself is LG.Display's LM270WQ2 and is listed as a "10-bit" panel, but true 10-bit support does require an end to end "10-bit journey". The panel is also technically an 8-bit with A-FRC technology on the panel side, supporting up to 10-bit colour. Have a read of this article which discusses it in more detail. It's all very well saying a panel is capable of 10-bit colour depth (1.07 billion colour palette) as opposed to an 8-bit colour depth (16.7 million colours), but you need to take into account whether this is practically useable and whether you're ever going to truly use that colour depth. Apart from the requirements of your application, operating system, graphics card and software, one more pertinent limitation is from a display point of view, where there must be an interface which can support 10-bit colour depth. At the moment DisplayPort is the only option which can. 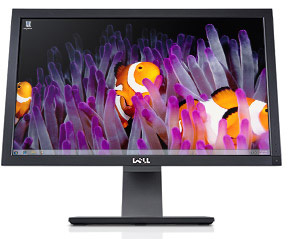 Dell do not specify whether the DisplayPort on the U2711 is 10-bit compatible. Regardless of whether you have a true 10-bit colour depth being displayed, a screen with 10-bit capabilities still has its advantages. The monitor should still be capable of scaling the colours well, even from 24-bit sources. Most of these 10-bit panels will also be coupled with extended internal processing which will help improve accuracy and these are better translated onto a 10-bit panel than they would be onto an 8-bit panel, giving less deviation and less chance of banding issues. The U2711 offers a 12-bit internal colour processing to help offer smooth gradients and provide clarity in subtle detail. Like many modern displays, the screen uses enhanced W-CCFL backlighting and can offer a colour gamut covering 102% of the NTSC colour space. This also covers 100% of the sRGB colour space and 96% of the Adobe RGB. An important thing to consider for most users is how a screen will perform out of the box and with some basic manual adjustments. Since most users won't have access to hardware colorimeter tools, it is important to understand how the screen is going to perform in terms of colour accuracy for the average user. I restored my graphics card to default settings and set it to its standard profile. 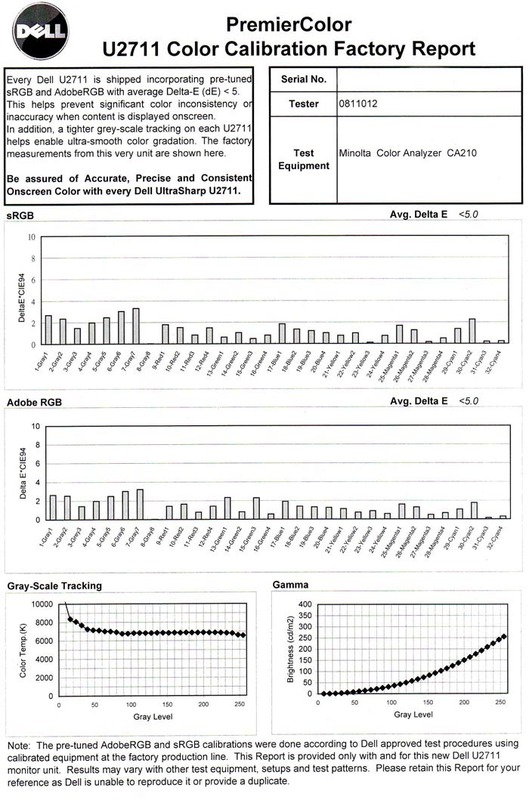 The U2711 was tested at default factory settings using the DVI interface, and analysed using LaCie's Blue Eye Pro colorimeter and their accompanying software suite. The results of the U2711 at factory settings were fairly average on the whole. On the left you can see the CIE digram demonstrating the colour space of the monitor (black triangle) against the reference sRGB space (orange). The screen has an extended colour gamut thanks to the use of W-CCFL backlighting, and the colour space stretches considerably beyond the sRGB standard in green and red shades. Wide colour gamuts are not for everyone though, and I would thoroughly recommend a read of this article over at X-bit Labs, which covers the pros and cons well. In terms of the performance of this screen, this result is what we were expecting given the monitor is specified with a 102% gamut. No issues here, just confirmation of the extended colour space. Gamma was a fair way off from the target setting of 2.2, being recorded at 1.9. We aim for gamma of 2.2 as that is the default for computer monitors. We know that the sRGB and AdobeRGB preset modes have been factory calibrated to improve gamma and colour accuracy, so more on that in the next section. Colour temperature was recorded at 5504k, a fair way out again from our target of 6500k, the colour of daylight. Luminance was far too high at default as well (this was at 50% brightness setting remember), being 208 cd/m2, a long way off our target of 120 cd/m2 which is the recommended luminance for LCD screens in normal lighting conditions. Having an overly bright factory setting is pretty common from modern screens, but if nothing else you will want to tone the OSD brightness down to around 20 - 30%. I found even the setting of 50% to be uncomfortable for any prolonged use. Black depth was recorded at a pretty respectable 0.25 cd/m2, giving a static contrast ratio of 832:1. Another pretty decent result from an IPS panel here in this regard. In terms of colours, they actually felt nice, no obvious tendency towards one shade and you could tell the screen had an extended gamut to the naked eye. For my uses, I have no issue really using an extended gamut screen for every day browsing and writing, but if you are doing anything colour critical or working with certain colour spaces (e.g. sRGB), you need to read more about gamuts as I've mentioned above. The default settings offered a fairly decent performance actually. Colour accuracy was fairly even across the board, and average dE was 3.7, with a maximum of 6.6. This was significantly better than the default settings of the U2410 which were measuered at 6.7 average and 9.8 maximum. The screen should be capable of more with correct calibration and profiling, but this was a reasonable start in terms of colour accuracy. For those without a colorimeter, you will want to tone down the brightness control, but the colour accuracy is at least fairly even across the range with no obvious tendancy towards one colour. You also have factory calibrated profiles available in Adobe RGB and sRGB mode which should help improve colour accuracy and gamma further (more below). You may also want to try our ICC profiles and settings we generated during our calibration. The Dell U2711 comes factory calibrated to some extent, and the box even includes a calibration report from Dell specific to the unit you have. It states that every unit is shipped incorporating pre-tuned sRGB and Adobe RGB settings and with an average DeltaE of <5. In LaCie's classification, this is still not great, but the thought is at least there and some attempt has been made to factory calibrate the screen. In addition to this, they have tweaked gamma and other settings to provide tighter grey scale tracking which helps to ensure smooth gradients. 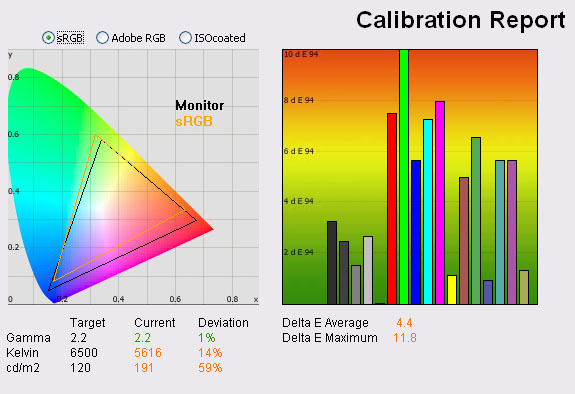 I've included a copy of the calibration report from the Dell factory below for you to review. Note that this report is only relevant to my specific test unit and they do state that results may vary with each setup and different test equipment. I was interested to see if this factory calibration helped at all with default settings. Note that this is only relevant for the sRGB and Adobe RGB (aRGB) preset modes available through the OSD menu. You will need to change from the default 'Standard' profile to benefit from these factory calibrated settings. The Adobe RGB gamut triangle is shown on the let as a reference, with the monitors colour space fitting this pretty closely. It did exceed the Adobe RGB space slightly in red tones although the colour space was being reduced slightly in this area compared with the standard preset and full native colour space. The mode is designed to fit the Adobe RGB as closely as possible, and so it does a fairly good job here. Gamma was pretty much spot on using this factory calibrated profile (1% deviance), but colour temperature and luminance were a fair way out from the targets. Colour accuracy was improved significantly compared with the default 'standard' preset, with dE average being only 1.7 now, and maximum of only 3.2. This was a very decent factory calibration actually and considerably better than the results we obtained from the preset Adobe RGB mode on the Dell U2410 (dE average 2.9, max 7.8). The factory calibration said dE would be less than 5 on average, and it was. The screen is certainly capable of even more, so this was not perfect results, but a big improvement compared with the 'standard' mode. If you don't have access to a colorimeter but want some improved colour accuracy, I would recommend this as the best pre-calibrated mode to use. Combine this with a brightness reduction to about 20 - 30% and you have a good starting point. Dell have included an sRGB emulation mode in the new U2711 in keeping with that offered on the U2410. Some extended gamut displays incorporate this hardware emulation as a way to limit the colour space being used if you need or prefer to work with sRGB content. These emulation modes work to varying degrees, and we've seen some which offer absolutely no reduction in the colour space (e.g. 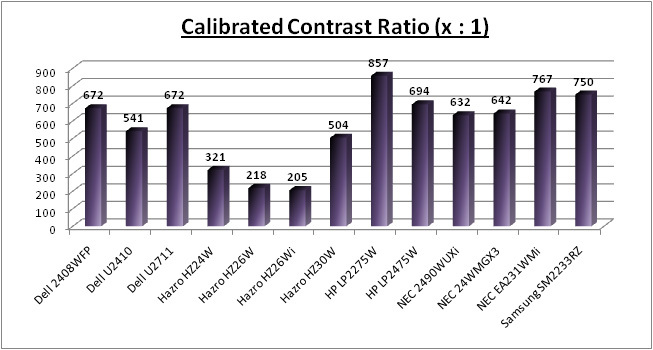 HP LP2475W) or other models where the colour space is reduced, but getting accurate colours was impossible (e.g. Dell 2408WFP). The 24" U2410 featured a fairly decent mode in this regard, limiting the colour space to reasonably close to the sRGB reference, and also allowing for calibration to improve colour accuracy. We will calibrate the sRGB mode in a bit, but for now we wanted to test the factory calibrated preset. Again, the colour space fits fairly closely with the sRGB reference, only being a little way out in red shades, and the gamut of the monitor stretches a little too far in these colours. Colours may still appear over-saturated or too 'neon' even in this emulation mode, but it's certainly cut the green colour space back compared with the extended gamut modes. Gamma was again very good, but you would still need to calibrate to reach the desired colour temperature and luminance. The problem with this preset was that the colour accuracy seemed to be pretty poor unfortunately, with an average dE of 4.4 and a maximum of 11.8. This kept it overall just within Dell's factory calibration boundaries of dE <5 overall, but only just. The colour accuracy in this mode was worse than the standard preset mode, but of course the screen is at least making an effort to emulate the sRGB colour space. If you don't have a colorimeter and are looking for optimum results with the presets, I'd only recommend using this mode if you really want to work with a smaller sRGB-type colour space and better gamma curves. Colour accuracy is sacrificed sadly compared with Adobe RGB and Standard preset modes. To carry out this initial calibration I switched to the custom color preset mode which affords me access to the full range of RGB controls in the OSD. I followed LaCie's calibration process through, adjusting the OSD settings in line with the recommendations made in the process, and then letting the software carry out the LUT adjustments at a graphics card level and create an ICC profile for me. A small point, but it was actually a little difficult to get the brightness setting at a decent level, and it took a couple of attempts. The software suggested a setting of about 20% would be good initially, but the calibration resulted in a lower luminance than desired. I carried out the process again, and settled on 30% brightness setting in the end, which then produced the above results. Other settings including the RGB levels are also listed above. The calibration was a success. It had obviously done a good job at adjusting gamma, colour temperature and luminance as you can see above, all being pretty much spot on now compared with our target settings. Black depth was a little lower now as well at 0.18 cd/m2, but contrast ratio was reduced a little as well to 672:1. This was an improvement over the black depth of the U2410 which was calibrated to 0.22 cd/m2. It was very close to the performance of some other popular IPS based screens we have tested like the HP LP2475W (0.17) and the NEC EA231WMi (0.15). More screen vs screen comparisons in a bit. Colour accuracy was also correctly nicely as well, offering a much better result than the factory default. Average dE was now 0.3, with a maximum of only 0.5. LaCie would consider colour fidelity to be excellent now. Colour gradients were smooth with no banding issues I could see. There was some slight gradation in darker shades. This is a good result when you consider the U2410 had some big problems adjusting and correcting colour accuracy in the 'custom color' preset, only allowing us to get dE average of 3.2 at best and max of 10.8. We had to revert to the standard preset to get the best performance out of the screen with the 24" model. Thankfully the custom color profile on the U2711 works fine. You can use our settings and calibrated ICC profile on your U2711 as well if you want. See our ICC profile database for more information. One of the odd 'features' of the U2410 was that it did not seem possible to calibrate the custom color preset properly, and so we had to revert to the standard mode to get the best results. 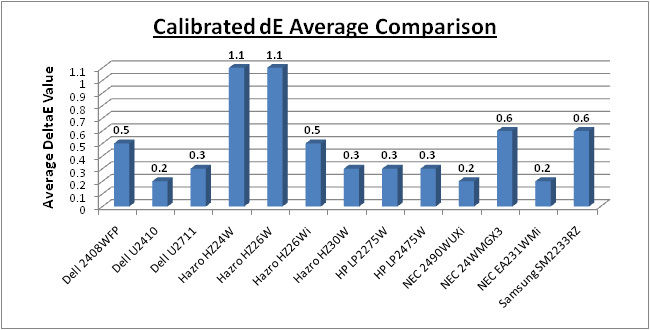 I wanted to check whether calibration of the standard profile on the U2711 produced any different results to our already excellent calibration above. All OSD settings were left as they were, but changing back to the standard preset meant RGB controls were not available at all. All corrections would be carried out by the automatic calibration process and at a graphics card level. Again we had good correction of gamma, colour temperature and luminance here. Colour accuracy was also very good with average dE of 0.3 and max of 0.8. This was ever so slightly behind the custom color calibration where max was only 0.5. You can get good results from both presets, but neither has a particular advantage over the other on this model. Again, ICC profile available if you want it in our ICC profile database. I reverted to the Adobe RGB preset mode again to determine whether this mode allowed for decent correction of colours. Factory calibration had already meant we had a good starting point with dE average of 1.7 and maximum of 3.2. Gamma was also spot on in this factory calibrated preset (at 2.2), but colour temperature was 14% out and luminance was far too high at 60% deviation from the 120 cd/m2 target. Calibration corrected this all nicely thankfully, and also improved the colour fidelity even further. dE average was now 0.6, and max of 1.5. Nice to see that calibration can correct the colours in this preset mode as well. Again, ICC profile available if you want it in our ICC profile database. I tested the screen as well in the sRGB preset which returned less than good results in default mode, even though the screen had been factory calibrated. Gamma was set up correctly by this factory calibration but colour temp and luminance were significantly out from the target points. Colour accuracy was also pretty poor, with dE average of 4.4 and 11.8 maximum. Some screens don't let you calibrate very well in sRGB emulation mode, but we had some good results with our test of the Dell U2410 before. Thankfully the U2711 performed well here, allowing us to improve the colour accuracy to 0.5 average dE and 1.0 maximum. The other targets were also met nicely. Again, ICC profile available if you want it in our ICC profile database. One thing which users found on the original A00 release of the U2410 was that when operating in sRGB and Adobe RGB preset modes, colour gradients showed an odd 'dithering' type issue in darker tones. It seemed some colours were being dropped, and in darker shades gradients were no longer smooth. Instead there was an obvious sign of spatial dithering and noticeable patterns in the darker shades. In January, Dell accidentally leaked a firmware upgrade for the U2410 which disabled the FRC in these two preset modes, and resolved the issue with the dithering artefacts. I checked the U2711 in sRGB and Adobe RGB modes in case it suffered from the same problem, but I'm pleased to report it did not. No issues here in any of the preset modes. I plotted the results of the U2711 against some of our other reviews of recent models and those in the same kind of size range for direct comparison. Out of the box, the average dE of the U2711 was 3.7 which was average compared with the other models here. Some, like the NEC LCD2490WUXi for instance offered even better default settings (2.3) but then that is a model aimed at the professional colour enthusiast market. The U2711 did perform better than it's smaller 24" brothers, the U2410 and the 2408WFP though which were poor at default setting (6.7 and 6.1 average dE respectively). Once calibrated, the U2711 performed very well. 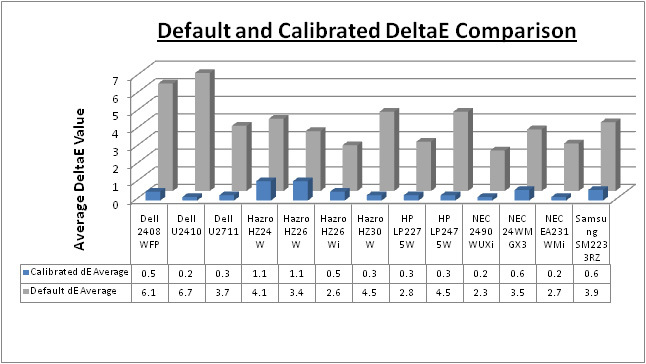 With average dE of only 0.3 it matched the popular HP LP2475W but fell ever so slightly behind the Dell U2410 (0.2) and our current champions - the NEC EA231WMi and NEC LCD2490WUXi (0.2 average / 0.5 maximum). It's perhaps no surprise that these are all IPS based screens, offering some of the best colour accuracy you can get in the market. TN Film and VA matrices can still offer excellent accuracy once calibrated, but it can't quite match these IPS models. 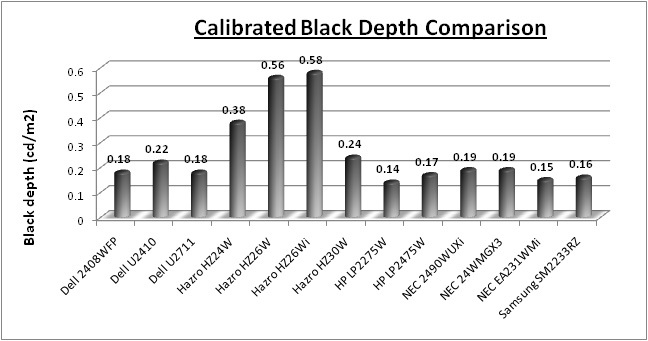 The above graphs show a comparison of the U2711's calibrated black depth and contrast ratio against the same models. The U2711 did beat the U2410 in terms of black depth, something which was a little disappointing when we tested the U2410 before. It also matched the previous Dell 2408WFP model (0.18), a testament to the improvements made in modern IPS panels since the 2408WFP was an S-PVA based screen. 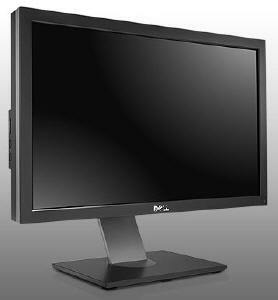 The NEC EA231WMi, which is also IPS based, held a slight edge with black depth at 0.15 and contrast ratio at 767:1 and is our current champion in terms of black depth / contrast ratio from an IPS panel. The S-PVA based HP LP2275W is the overall champion of these sized screens we have tested, with an even lower 0.14 black depth and a slightly higher 857:1 contrast ratio as a result. The above results were pleasing, with contrast remaining very stable across the entire range of brightness adjustments. At 100% brightness, the screen was capable of a luminance of 259 cd/m2, a little way off the maximum according to the specification of 350 cd/m2. Nevertheless, you are probably unlikely to want to use the screen at higher luminance day to day. Black depth at maximum brightness was recorded at 0.31 cd/m2, and this gave a static contrast ratio of 834:1. This was pretty much maintained across all the adjustments which was good. At minimum brightness adjustment, the screen was recorded at 49 cd/m2 luminance, and 0.06 cd/m2 black depth. Without other calibration methods, setting the brightness control at about 20 - 30% should give you a luminance of around 120 cd/m2. The graph plotted below shows the stability of the contrast ratio across the whole range which was very good. The Dell U2711 features a dynamic contrast ratio (DCR) control, which boasts a spec of 80,000:1. This is obviously a pretty huge number and requires the screen to be able to produce a very bright white, and a very dark black at the two ends of the control. Dynamic contrast ratio involves controlling the backlight of the screen automatically, depending on the content shown on the screen. In bright images, the backlight is increased, and in darker images, it is decreased. For this test I would use the colorimeter to record the luminance and black depths at the two extremes. Max brightness would be recorded on an all white screen once the DCR has caught up. Black depth would be recorded on an all black screen. The DCR feature can only be selected through the OSD when you have entered the 'game' preset mode. Not sure why it wouldn't be available in 'multimedia' mode to be honest, as you'd have thought some might want to use it for movies and videos too. While this mode is in use, you cannot manually adjust the brightness or contrast settings in the OSD. The changes are quite smooth and subtle so are not going to be too obvious to the naked eye as content on the screen changes. The dynamic contrast ratio control didn't seem to do much to be honest. We'd run the same test with the U2410 and only achieved a dynamic contrast ratio of 1402:1, and this time with the U2711 we had only reached 759:1. The DCR mechanism didn't seem to want to reduce the brightness down far enough when dark content was being displayed, and so black depth was rather mediocre. At the top end, the luminance only reached 251 cd/m2, and we've already seen in our contrast stability tests that 100% brightness only yields a luminance of 259 cd/m2 tops. Even if the screen could reach the maximum specified brightness of 350 cd/m2, you'd need a black depth of 0.004 cd/m2 to give you an overall dynamic contrast ratio of 80,000:1 so this spec is surely exaggerated. Viewing angles from the U2711 were pretty good. Being H-IPS based, the panel was free from the obvious blackening you will see from below on TN Film matrices, and some of the other rather obvious colour tone and contrast shifts from that technology. It was also free from the off-centre contrast shift you see from VA matrices as you move your head away from a central point. Vertically you could see a shift in the contrast as you moved your head away from a central point, especially from above. Horizontally, you had to reach an angle of about 60° before there was any significant change in contrast detectable. The U2711 does not feature an A-TW polarizer, which is sometimes used on other H-IPS based models in this sector. This is designed to improve black depth at wide angles, but is rarely used nowadays. Models without the A-TW polarizer can sometimes show a purple tint to a black background from extreme angles, something which we saw quite clearly on the Hazro HZ26Wi for instance. There was no obvious sign of any purple tint here from the panel as there was with the Hazro, but you could detect it slightly from extreme diagonal angles. The uniformity of the panel was actually very good, with only a small variance as you reach towards the edges, and a little bit more in the bottom left hand corner. Even there, the variance was only about -12% so was minimal. Thankfully there was no severe uniformity issue in this test. I tested the screen with various coloured and grey solid images to determine if there was an evidence of colour 'tinting' on this model. This is something which has been affecting some users of the Dell U2410 and the HP LP2475W recently, where you can spot an obvious colour cast in different areas of the screen. This is commonly characterised by a green or pink colour tint in some areas of the screen, showing an obvious problem with uniformity. This is often described by a variation from one side of the panel to the other. This should not be confused with colour rendering problems associated with calibration and profiling, which can be fixed by software means. This issue is hardware based and seems to be related to the uniformity and construction of the panel itself, and perhaps associated also with it's coating treatment. Since the HP LP2475W and Dell U2410 use very similar 24" LG.Display panels, they have both been affected to varying degrees. Some users have had some major problems with this issue, even after returning and RMA-ing several times. Remember though, there are also thousands of happy users out there who have no such issue or even if they do, would never spot it or worry about it in day to day use. After testing the U2711 sample we had, I could see no issue with colour tinting or uniformity across the screen. I'm sure this might have been a concern to readers familiar with the U2410 reports, but I'm pleased to say we saw no problem in this example. I've seen some mention of the problem from early adopters of the U2711 so I'd suggest if you can you check out the screen in person to be sure. It remains to be seen whether the U2711 will be affected much or not. It should be noted that the sample we had was not a hand picked Dell test sample, but a random sample from a stock of screens available for purchase. I also ran a uniformity test to determine the variance in colour temperature / white point across the screen. 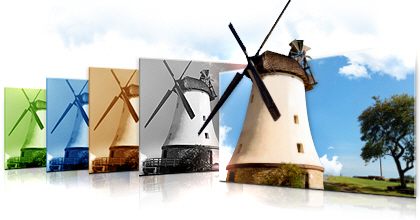 If there was any obvious colour tinting it should affect the colour temperature to some considerable degree. I could not detect any tinting with the naked eye, and observing various different colour blocks. The test above shows the deviance from the colour temperature in the centre of the screen, with a maximum deviance of only 6.5% along the right hand edge. All in all, the white point was pretty uniform across the screen, and supported the observations made without measuring tools. As usual we also tested the screen with an all black image and in a darkened room. A camera was used to capture the result. There was a few areas of very slight unevenness noticeable to the naked eye, and these were picked up by our camera too. The four corners showed some slight leakage from the backlight, but nothing very severe at all and slightly exaggerated in the picture above. In day to day use you would certainly never see any issue from this. The U2711 features a massive 2560 x 1440 WQHD resolution which is only just a little bit less vertically than a 30" screen. The pixel pitch of 0.233mm is very small as a result, and by comparison the Dell U2410 has a pixel pitch of 0.270mm and the 3008WFP has 0.250mm. The new screen offers the tightest pixel pitch and therefore the smallest text as well. I don't find it too small personally, but day to day I am used to a 24" screen. Some users may find the small text a little too small to read comfortably, and I'd advise caution if you are coming from a 19" or 22" screen for instance where the pixel pitch and text are much larger. I found a 30" screen to be quite a change with text size when I first used one, and this is very similar and even a little bit smaller! Having said that, the massive resolution is really good for office and general use, giving you a really big screen area to work with. It is a noticeable upgrade from a 24" 1920 x 1200 resolution, and it's good to see Dell have opted for the high res panel here rather than sticking with another 1920 x 1200 res panel as they have in their previous 27" models. For those wanting a high resolution for CAD, design, photo work etc, this is a really good option. The image was very sharp and crisp and text was very clear. With a resolution this high, some users will no doubt want to know if the scaler chips can handle interpolation well or not. Some may even want to use the screen outside of the native resolution, but be warned, this will impact on sharpness and picture quality. For comparison, I tested the screen in 1920 x 1080 resolution (1080 HD resolution, and popular amongst modern 24" screens). As you can see from the close up macro photos above, the font is very crisp and sharp when the screen is set at its native resolution. It becomes less clear and seems to overlap more pixels when it is trying to scale a smaller resolution onto the panel. This is of course very common for any screen where you use it outside of its native resolution. Although text was perfectly readable and quite adequate when using a lower resolution, I'd obviously recommend using the native resolution wherever you can for optimum results. 1920 x 1080 also feels too big for a screen of this size. The screen did have a range of 8 preset modes available via the OSD, but unfortunately there was not one for 'office' or 'text'. Sometimes I think those can be quite useful, particularly if you want to have a brighter default profile for most of the time, but need a darker, easier on the eye setting for prolonged office work. You will need to settle here for adjusting the other presets to a desired luminance, and I would recommend turning the brightness control down to about 20 - 30% to reach a comfortable luminance level. It may have also been nice to see an automatic brightness control sensor included which some other models feature. The height and tilt adjustments made it possible to get a comfortable position for the screen which is always important. The pivot movement was very stiff so pretty much unusable however. No rotate feature here which some may find useful for portrait office work, but it is pretty impractical at this size anyway. If you are using the VGA D-sub interface for connectivity, you are limited by a maximum resolution on this screen of 2058 x 1152. The Dual-Link DVI interface (or DisplayPort in fact) is needed to benefit from the full 2560 x 1440 resolution and so understandably, some picture quality is lost if you only use VGA. The Dell U2711 was tested using the chase test in PixPerAn, a good bit of software for trying to quantify differences in real terms responsiveness between monitors. As a reminder, a series of pictures are taken on the highest shutter speed and compared. The images below show the best case example on the left hand side, and the worst case example on the right hand side. This should only be used as a rough guide to comparative responsiveness but is handy as a way of keeping a constant test of each screen. 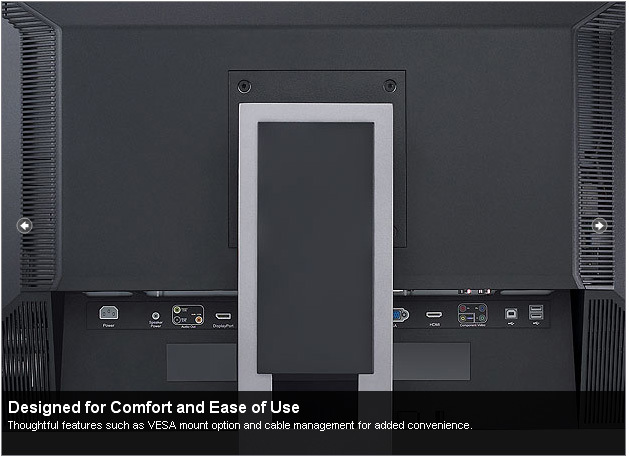 The U2711 uses LG.Display's latest LM270WQ2 27" H-IPS panel. This utilises response time compensation (RTC) to boost the response time across grey to grey transitions and the manufacturer quotes the minimum response time for the panel to be 5ms G2G. 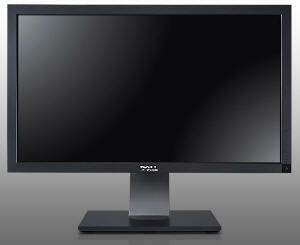 Dell have re-classified the panel at 6ms G2G according to their specs, which is in line with their 24" U2410 model. We have provided the PixPerAn images above alongside 3 other very popular models in the 24" market, all using H-IPS panel technology. The responsiveness of the U2711 was good. There was no obvious ghosting of the moving car or trail images behind it which was pleasing. Often screens without RTC, even TN Film based, can show a noticeable ghost image in these tests. The NEC EA231WMi for instance has a quoted spec of 14ms and either uses no RTC, or a very gentle application. You will spot the trailing behind the car even in the best case example shown. The Dell U2711 was very similar in performance to the HP LP2475W in fact, as it did show a noticeable dark trail behind the moving car which was detectable to the naked eye. This was a case of RTC overshoot, where the RTC impulse is not controlled accurately at all times, leading to a dark trail in moving scenes. This was also noticeable on the HP LP2475W, whereas the Dell U2410 seemed to show a less obvious issue here, probably down to a well configured overdrive impulse. This dark trailing on the U2711 was noticeable in this test, but did not give any severe problems as was made "famous" when Dell first released their 2407WFP-HC model. All in all the responsiveness of the U2711 was pleasing, with only a minor issue relating to the poorly controlled RTC impulse being evident. Obviously the screen does have the same limitations associated with most modern screens, those being perceived motion blur and the limitation of the screen to 60Hz. 120Hz technology is becoming more and more common, so if you want a screen which can support a true 120Hz and a higher frame rate you may want to look elsewhere. For comparison I have also put the results from our current reference screen above, the Samsung SM2233RZ. This shows the type of responsiveness that is possible from a modern display. The Dell still performs very well as you can see, but there is still a slight blurred trail even in the best case image, something which is almost none-existent in the Samsung test. The Samsung is also free of the RTC overshoot artefacts evident on the Dell, and this is largely due to the use of 120Hz technology which helped eliminate these issues in our tests. As a side note, the screen does feature a game preset mode which affords you access to the dynamic contrast ratio control if you want to use it. Some gamers like this as a feature, some do not so that's down to preference. We've already had a look at the feature, and while it works to some degree it does not seem to reach anywhere near the specified DCR. There is also hardware aspect ratio control available through the OSD with options for fill, aspect and 1:1 pixel mapping. The input lag of the U2711 was fairly mediocre really with an average input lag of 30ms, and very similar to that of the U2410 (33.8ms average). 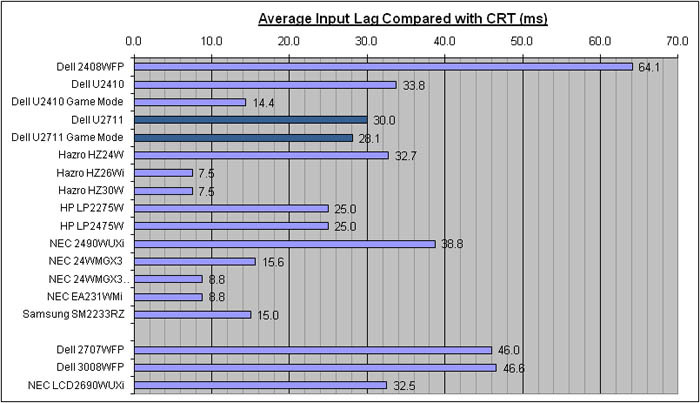 The input lag did reach up to 40ms fairly commonly but was not as bad as some other models like the Dell 2409WFP (64.1ms) or the Dell 2707WFP (46ms). The smaller Dell U2410 featured a 'through mode' type technology when using the screen in the 'game' preset mode, which helped bypass some internal circuitry and reduce input lag from 33.8ms down to 14.4ms. I tested the U2711 in game mode as well, but this model seems not to offer any improvement and input lag was still 28.1ms on average. This slight difference can just be put down to randomness, and not a reflection really that it's any better than any of the other presets. Dell don't mention or specify that the game mode has any impact on input lag, so I would consider this confirmation that it doesn't. Overall I don't have much bad to say about the Dell U2711 to be honest! 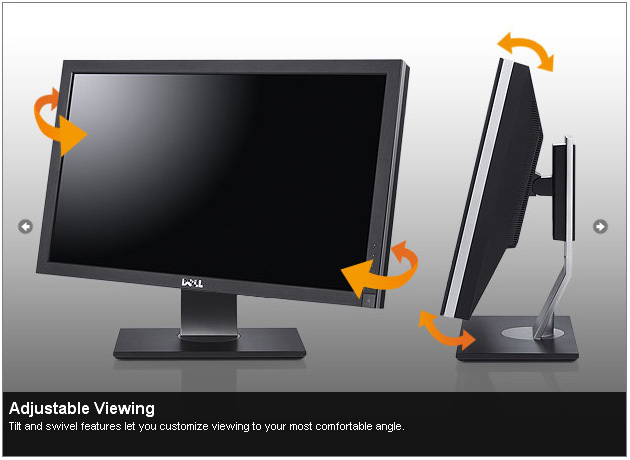 Dell have met expectations as usual in terms of a wide range of ergonomics, interfaces and features from the screen. The use of IPS panel technology was a great move, and there are no real sacrifices in terms of responsiveness, black depth, contrast with that change. The ultra high resolution was a nice thing to have, although I do feel it won't be to everyone's liking and could well require some getting used to (and some good eye-sight!). Colour accuracy was excellent once calibrated, and the sRGB and Adobe RGB presets worked well, with good factory calibration in the case of Adobe RGB, and were free from any issues associated with these modes on the initial release of the 24" U2410. Black depth, contrast and contrast stability were all very good, especially when you consider this is an IPS panel. The dynamic contrast ratio was pretty useless and miles off advertised spec though. We also saw no issues with uniformity and no sign of the dreaded 'tinting' which has caused problems for many U2410 users. It's still something to be cautious of I expect, but no issues with the screen we had. Response time was good, although there was some noticeable issues with dark RTC overshoot and trailing. Input lag was also mediocre, and lacking in any 'through mode' to reduce. This screen isn't really aimed at gamers of course, so the performance in these areas is still more than adequate for most users anyway, and actually better than I was perhaps expecting. In terms of price, the U2711 retails for around £900 at best (£770 exc VAT), which is a large amount of money for a monitor of this size. You can still pick up the 2709W for about £600 and even the 30" 3008WFP for £1200. This makes the U2711 pretty expensive really, but what you are paying for really is the high resolution panel, something that the previous 27" models did not offer. This is pretty expensive when you consider that the monitors features and performance is pretty comparable with the 24" U2410, which retails for only ~£450 (£350 exc VAT). I think the new U2711 is priced a little high personally when you consider it's twice as much as the U2410, but perhaps price will come down with time.